You would think that even in these days of meteorological uncertainty, snow above the Arctic Circle could be relied upon in February. Alas no. The normally snow-laden Lofoten Islands in northern Norway were bare this year; naked; bereft of their white mantle; lacking in the wow factor that I’ve become accustomed to. Still, there’s no point in griping (although I’ve always found it helps), one has to do one’s best. Despite the ever-present ingredients of aquamarine seas, jagged mountains and ice-encrusted lakes, I don’t find this an easy place to photograph. Despite its remoteness Lofoten is surprisingly well developed making it difficult to find clean compositions. Some photographers like rustic fishing cabins and bobbing boats, I generally don’t. It’s also a place that doesn’t lend itself to settled conditions. Mood and drama are what’s needed; skies full of menace and bruising; malevolent seas and lakes which groan under constant freeze-thaws. 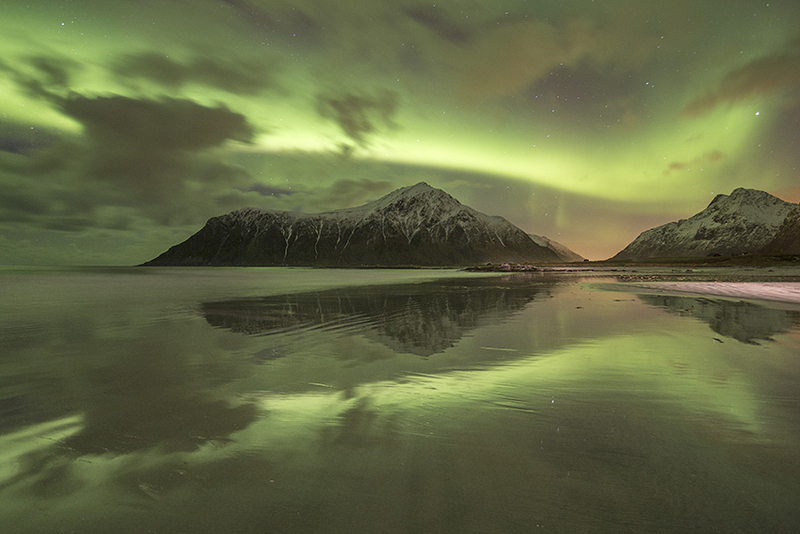 Lofoten needs to be in a very bad mood for the photographer to capture its real spirit. Speaking of bad moods, I adopted mine as usual (that damned aurora is never in the right place at the right time) but thankfully for the preservation of group sanity, our ever-chirpy guests retained good humour despite often challenging conditions. We worked hard and eked out some successes alongside the failures. Our base in Ramberg was perfect and although Norwegian cappuccino leaves a lot to be desired, not to mention their unhealthy preoccupation with dodgy looking fish products, we were kept well fed and watered throughout. Waffles should be the staple food for all humans everywhere. So, a trip with mixed fortunes but as ever, one of fond memories. Inevitably I incurred the usual camera damage thanks to a particularly furtive patch of ice which disguised itself as sand, but that’s now sorted thanks to assistance from a couple of colleagues who just happened to turn up on a remote beach…don’t ask. Thanks also to Sunny at CVP for rapid response. I hope you enjoy these few quickly-processed images of Lofoten in winter. Thanks to the Lofoten ’14 group – you know who you are. Sorry to hear you didn’t get the mantle of snow we had last year. The pictures still look good nonetheless. What is more alarming however is the fact that we might be eating cod’s tongue waffles next year. Don’t worry though, I’m sure they’ll make you some chips if you ask them nicely. Good to see the big boy getting some use, very nice shots as ever Pete. I think this set of images shows a real progression in your landscape work – particularly the 3rd from last picture. Nice work.